Life is always CRAZY here in St Paul!! We were crazy busy this week because we moved 3 apartments! We are now living in the center of our area instead of the edge, so that makes life SO much easier. We spent basically all day moving furniture and packing up our entire apartment so they can close it. Then, the next day we helped move in the Hmong sister missionaries to their new apartment they got, and on Friday we did some service for a family in the ward helping them move to a new house. So, if we keep going at this pace we will be jacked by the time we go home😂. We obviously didn't get as much time this week for working, but within the all the craziness of moving 3 days in a row, the Lord blessed us with some pretty sweet miracles! 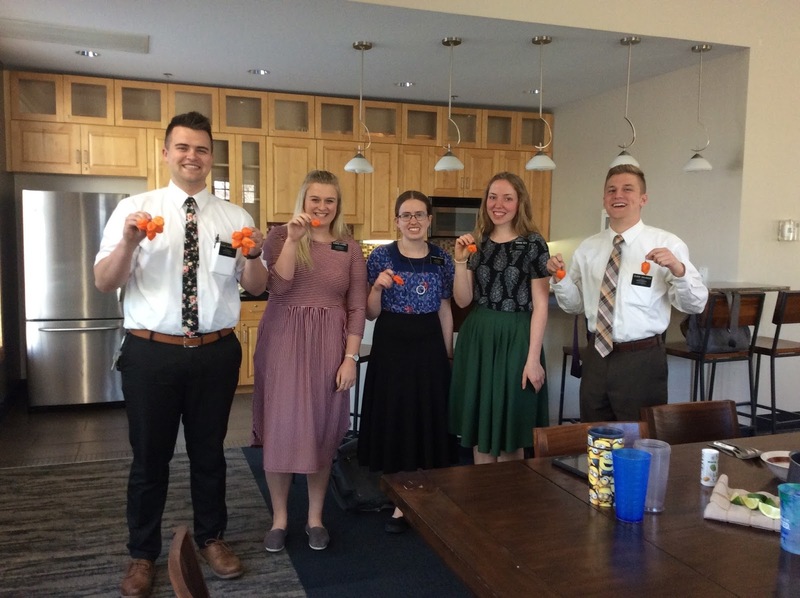 1) After our move on Wednesday we had a lesson with the member family we started teaching who want to come back to church and start attending the Spanish ward. We taught them about eternal families, and we sang the children's hymn "I am a child of God". The spirit was really strong, and it helped to bring back some memories of their conversion to the gospel of Christ. Leading up to the end, we planned to talk about the importance of families being sealed for eternity in temples, and before we said anything Jose says - "Yeah we had a goal to get sealed in the temple a while ago but things just got in the way. We want to have that goal again". We were like, well we can help you! !😁 haha. Super exciting! 2) After that lesson we had a crazy night. We had a lesson with an investigator named Brenda who was a former investigator who we ran into again at the food shelf we serve at. Long story short, we lost her number and didn't have any way to contact her to reschedule our lesson earlier that day. We both felt inspired to stop by later that night to hopefully get in contact with her again. Not only was she home, but her husband was also home this time and we had a really awesome lesson about the Book of Mormon with them both! Yes!! So right after we walk out the door of that lesson, we were just filled with joy from the spirit and the opportunity we had to teach both of them. We go to the door to walk outside when we saw flashing lights going off. All of a sudden some paramedics walk in and there's a guy sitting on the steps super red and out of it. It happened to be this guy we've seen two times before and contacted last week. They start shooing us away saying they need privacy, but the guy couldn't speak English so we offered to translate for them. It was crazy how the Lord led us to be there with impeccable timing to help this guy get to the hospital. And obviously God has placed this man in our path 3 times now for a reason, we just need to find out why! 3) We had a tender mercy while moving out of our apartment. We prayed that we still could be effective despite having to spend all our time moving and what not. We were walking out to throw away trash and this lady named Tracie comes up to us and we start talking to her. She was really stressed and worried because her husband hadn't come back home since the night before and she didn't know where he was. We offered a prayer with her, asking Heavenly Father to help Him to be found with no harm. Literally 3 seconds after I said amen, her friend pulls up in her car with none other than her husband in the passenger seat!! It was probably the most immediate response to a prayer I've ever seen!! The Lord truly does love us and is aware of us in all of our moments of desperation. It's so comforting knowing that the Lord will answer all of our prayers, big or small, as long as we have faith! We have also been able to give a priesthood blessing just about every day for the past two weeks. Two hermanas in our district are being transferred, one is going home and the other is going to Rochester. We were able to give them priesthood blessings of comfort, and we've had so many faithful members ask us for healing and comfort blessings! I've gained such a testimony and gratitude for this authority we have restored on the earth to literally be instruments in the Lords hands. After our district meeting, as a goodbye, we had the classic Spanish missionary challenge... Habaneros!! I downed four, and I basically died😂 straight got two hours of sleep that night lol. My companion on the other hand went for the mission record and took the cake with 10!! Don't know how he survived lol. "Personal Sacrifice is an invaluable force that drives our decisions and our determinations. Personal sacrifice drives our actions, our commitments, and our covenants and gives sacred things meaning." What can you sacrifice in your life to better honor the sacrifice of the Son of God? I love all of you and thank you for all of your love and support!